UPDATE: (8.22.18) Due to the anticipation of Hurricane Lane, all remaining C-SPAN events have been cancelled for Maui and Oahu. C-SPAN, the Washington, D.C.-based pub­­­­lic affairs network, in coordination with Spectrum, is heading to Hawaiʻi August 15-25 as the next leg of the network’s 14-month 50 Capitals Tour. 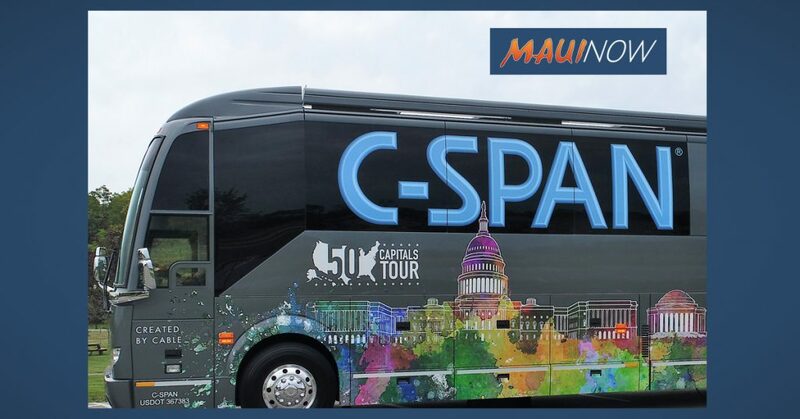 Together, C-SPAN and Spectrum are bringing the 45-foot C-SPAN Bus on a boat to the islands of Oʻahu and Maui, where, in addition to hosting community events, C-SPAN will produce public affairs programming, including segments for its ongoing C-SPAN Cities Tour. That programming, showcasing a variety of Hawaiʻi venues, public officials, non-fiction authors and local historians, will be featured on all three C-SPAN networks during the October 6-7 weekend. The C-SPAN Bus visit to the state Capitol in Honolulu is the 39th capital city visit along the tour. On Tuesday, Aug. 21, a bus welcome event will take place at the County Building in Wailuku from 11 a.m. to 1 p.m.; followed by a visit to the Queen Kaʻahumanu Center in Kahului from 3 to 5 p.m.
On Wednesday, there’s a morning event at Baldwin High School, a mid-day visit to the University of Hawaiʻi Maui College for the Campus Fest, and an afternoon visit with the Maui Economic Development Board. On Thursday, Aug. 23, the bus will visit Lahianaluna High School in the morning, and hold a mid-day event with the Kiwanis Club of Maui. 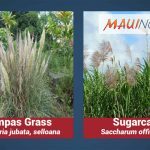 *During the visit, C-SPAN will also conduct interviews (media-only events) scheduled at the Alexander & Baldwin Sugar Museum in Kahului and ʻĪao Valley State Monument in Wailuku. More events/shoots will be confirmed within the next week. Moving the C-SPAN Bus around Hawaiʻi requires a great deal of logistical planning. C-SPAN will ship its motor coach by boat from San Diego, California, on August 8, arriving in Oʻahu on August 15. Following events around Oʻahu, the Bus will depart by boat for Maui and then sail back to Oʻahu before its August 28 return voyage to San Diego. The C-SPAN Bus, which is celebrating its 25th anniversary, embarked on the 50 Capitals Tour in September 2017 to engage students, community members and elected officials in every state — through on-board interactive tablets and stations and by talking with residents about issues important to them for C-SPAN’s social media campaign, Voices from the States. C-SPAN3, featuring American History TV, on channel 46 and on the web at C-SPAN.org. All funding for C-SPAN operations, including Bus and Cities Tour visits, are provided by cable and satellite television providers.